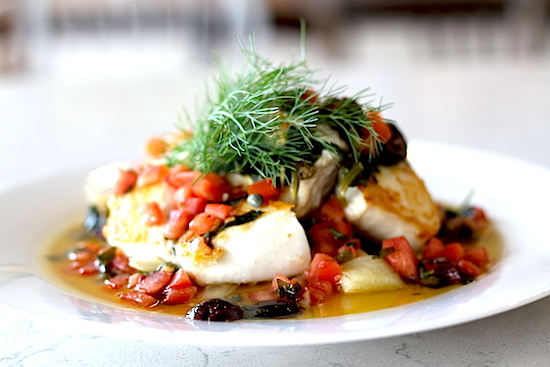 Bring on the olive oil for this classical Provençal meal of pan roasted filet of brill, sauce vierge and a confit of fennel. The sauce vierge (virgin sauce) combines the aforementioned olive oil with a scrumptious blend of tomato, olive, lemon and basil. The fennel confit is topped with the brill, which has been kept crisp on the outside and just a tiny bit undercooked on the inside. Dan recommends saving the excess confit oil to share with others or treat yourself. *Note: This dish could be made with fillets or steaks of fish that you like. • Place all of the ingredients in a pot, cover lightly with a circular dish of parchment paper known as a cartouche or a lid will work just fine. Place on medium heat and cook until most of the liquid has evaporated and the fennel is soft. • Heat olive oil to the temperature of a warm bath and add basil stalks, crushed chili, fennel seeds, garlic, lemon zest and finely chopped flat leaf parsley (some stalk is ok, but try to limit it as much as possible). After about 2-3 minutes it is time to remove the basil stalks. Once that is done add in your capers, olives, tomato concasse, lemon juice. Turn the heat off about now. Have a little taste to see if you need to add any salt. The olives and capers may make it salty enough. Taking the left over basil leaves, roll them up and run your knife through them and add them to the pot. • Remove from heat and allow to stand for five minutes. • Heat up a non-stick frying pan to a medium heat. Add a splash of Canola oil. Season the brill with salt on both sides. Lay the fish down in the pan and cook on one side over medium heat for approximately 3-5 minutes. To roast, place the oven friendly pan into a pre-heated oven at a high heat for another 3-5 minutes. Put the fennel confit in the middle of a plate. Lay the fish delicately on top. Spoon sauce vierge over the dish. Serve immediately.